Under North Carolina’s Medicaid Transformation plan, practices attesting as Tier 3 Advanced Medical Homes (AMHs) can receive care management revenue and value-based payments from health plans for meeting quality targets. Irrespective of your practice type (system-based or independent), practices need to reach five categories of requirements to attest as Tier 3. Without the right partner, this process could be cost prohibitive and time consuming. One practices can successfully achieve Tier 3 AMH status is by accessing services offered through Community Care of North Carolina, or the Community Care Physicians Network. 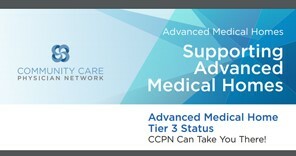 Click here to find more detailed information on how CCNC/CCPN can help your practice reach the quality goals of a Tier 3 AMH.